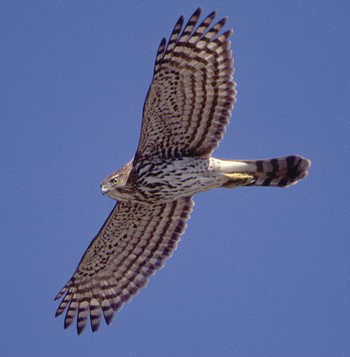 He must have lived a looooong good life, but by the shape his feet – and his talons were in – and the fact, that he was kind of emaciated and had little breast fat – he was an older Hawk. Maybe the harsh breezes caught him off guard. It sends the spirit home…. 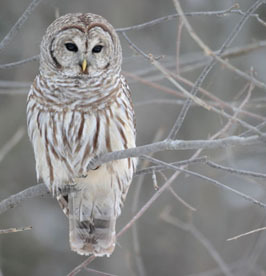 I drummed, until I “saw him rise up and out” and of into the trees behind the house…. Then it was OK, to make use of his feathers – to the very BEST of my ability. Feathers are carefully sorted and cleaned. Putting them into the freezer for a few days will take care of anything still living on or in them. Wings have to be spread out, to dry, the bone needs to be cleaned up and sealed up. Talons also need to be cleaned up, then carefully spread out and pinned onto a sturdy board – then left in a save insect free place for several month. 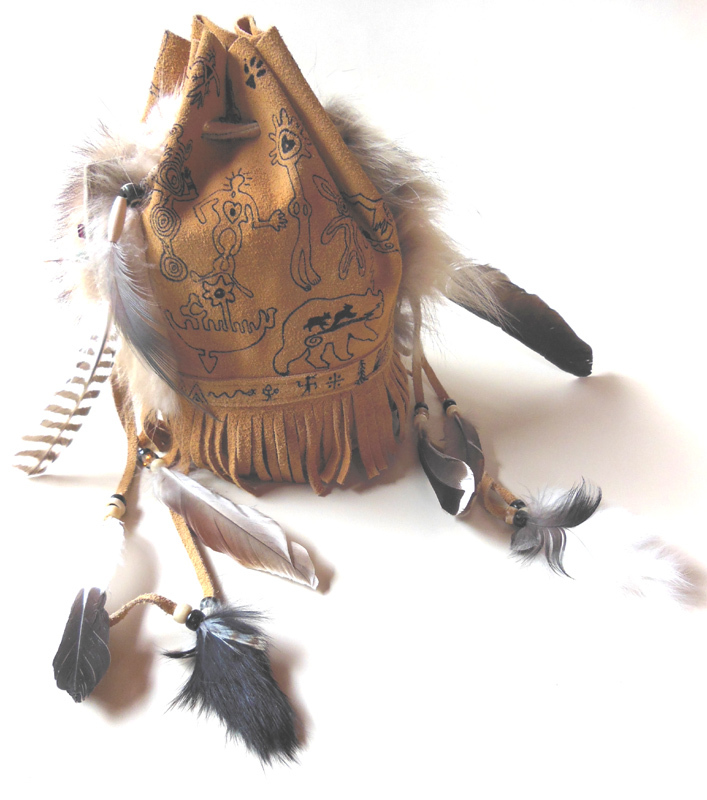 Set the wing into a sturdy piece of wood and then dress it up with accompanying feathers, fur and beads to create a smudging fan or dance fan. 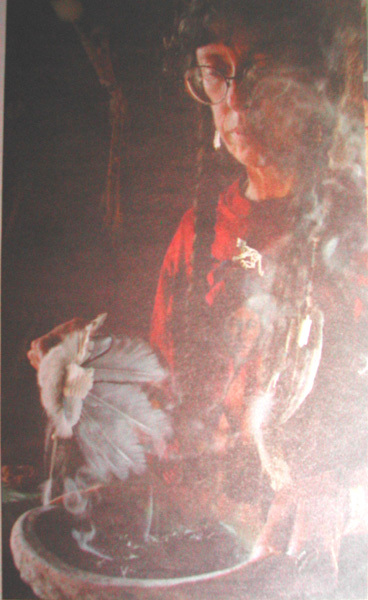 Ad some bone carvings and a few “tail feathers” from other birds and then it is time to smudge and invocate them. Dalva had previously explained, that in her tradition one drums for at least an hour, often 2 to 3 and that she at times drums up to 5 hours when journeying after sun down until sunrise next morning. I agreed with her, that too is Siberian practice, but here in the very popular “shamanic workshops” they do a number of short 10 minute trips – which is why many people in the end have trouble journeying and rarely go into full (theta brainwave) trance….. In the circle several people were drumming, using frame drums and djembes, others had rattles, others also chanted or sang… I was a bit like a prolonged community drum circle, but pleasant. I prepared my fur, so I could lay down on Ee’ren Eder ( my Reindeer Spirit and Clan Guide, represented in physical reality through my Reindeer fur, used for journeying only.) – To put the fur into the tight chair would not work and it was comfortable to use the armrest of the chair to keep the drum level….To drown out some groaning and squealing that was going on, I settled into a steady 180/ minute beat. ….I “see” Lira (my Screech Owl Guardian) flying ahead of me ~~ 2 meters above the ground, leading the way through a scraggggly Forest with lots of rocks, gray granite with veins of white quartz, huge boulders, deep barren ravines, boggy at times, Aspen and Spruce, underbrush with Blueberry bushes… It is a gray evening on a cold rainy day. We come up to a steep rock wall. Lira lands on a small Spruce Tree that is almost leaning against the steep incline. I have to step across a wide crack in the rocky ground to get there and – – – find myself standing on the granite rock cheek of a GIANT!! !Forest Spirit Person, that has been here forever. I am standing on his left cheek, in front of his massive granite nose, to my right looking up into his GIANT eye and furrowed brow high above it. Looking down, to my left I see the Giant opening his cavernous mouth with large ivory colored teeth and then and there I am being sucked towards that, I see his tong like a giant Beaver tail… I am sucked into this maw and slide down a long tubular “riffely tunnel, that must be his gullet. Like coming down a water slide I am splashed into a large reddish brown glistening cave. There are – like stalagmites and stalactites – but all made from living flesh and bone. Nevertheless, there are rock drawings and carvings in red and black everywhere on these formations. In the middle the cavernous stomach is a large fire. Beyond that, further down there is a dark black tunnel..
– – playing a kantele! Oh!! now even in the trance journey I know, where I am! There also is, on the other side from Väinämöinen a large Bear sleeping further in the back and a large Moose is sitting in the center on a rock. He is crying. In his lap he is holding one of his broken of antlers, while a strange stubble on his head is rapidly growing into a sizable Wapiti Elk antler. Then the other large majestic Moose antler falls of and the Moose wails in futile desperation. “ They will not know me!!! !” he wails, while a small bird settles on the now quickly growing Elk horn and starts chirping loudly. 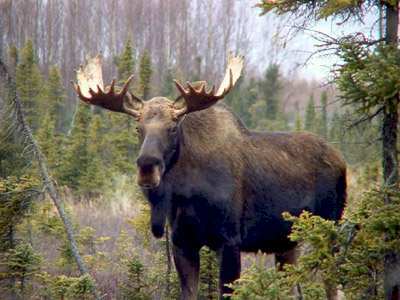 I try to help the inconsolable Moose, try moulding the second, just growing rack into a more Moose like looking antler, flattening it out a bit, …. But I need more stuffff and grab dripping spittle and juice from the belly stalagmites and some flesh from the ground nearby. Like as if it was puddy I manage to form it all into a Moose antler. – But for the other side it was already too late – that one was fully hardened into a sizable Wapiti antler. Now however Väinämöinen on the other side of the fire starts to sing and to my and the Moose’s high horrrror the newly formed Moose antler changes into another Elk/ Wapiti horn and then , oh shock, the whole Moose changes into a Wapiti Elk in front of my eyes. Lira appears and gives me more “cave spittle juice” and I rub the animal with it and it starts to flimmer and shimmer as a Moose again… – until Väinämöinen again starts to sing…. When he stops the animal is half Elk, half Moose and a mess. – – I say:“YES!! I KNOW!!!! I WILL tell her and explain – (like sooo many others )– and just hope she will not take it the wrong way…“ I promised the Bear. Healing comes with understanding – on both sides…. When I get back there, it feels like “late” But now the fire is out and through a vapory smoke I see a black Wolf with a white triangle on his chest standing at the entrance of the passageway into the gut of the Giant, beckoning me to follow him. By the time I am back down I am “not very deep” and hear the room in the background. For a flash I see Sandra D. sitting at the River’s edge reading a book made up out of Oak leaves. But I am halve “awake” and realize, the drumming has almost stopped – it is just me and the djembe left…. I have to return – never mind the other messages… I feel being dragged own by a soup of heavy molasses and struggle against it… I should journey on, but I am no at home but at Dalva’s circle…. I struggle against the sour smelling molasses until Lira brings a watering can with “Muskoka rain water from the flood” and douses me until the molasses comes of. I feel Peter and Janet next to me……. 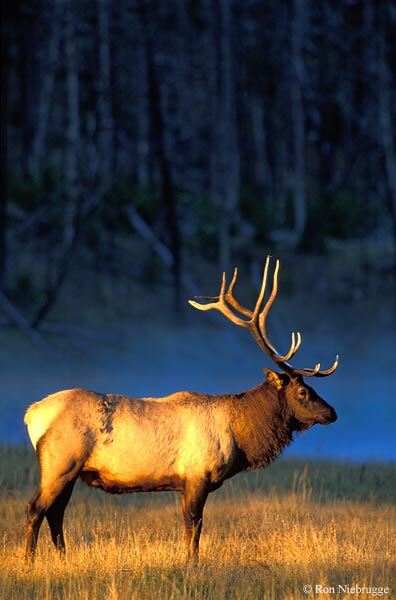 The Moose/ Elk Wapity: During Dalva’s teaching talk she referred to her special Guardian ans an Elk – and the picture that came across to me (in pre-verbal imagery ) was a Moose. However, most of the circle participants – hearing the word “Elk” envisioned a Wapiti, like we have out in Western Canada. Wrong critter. The Moose in the cave – and in the Kalevala is upset because he is not seen by Canadians as / for what he reallllly is! 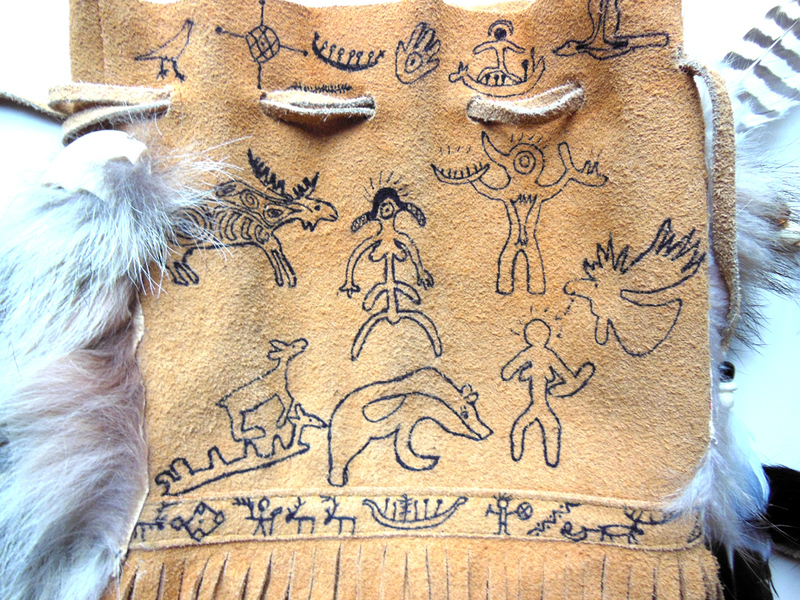 Meaning : these 2 have VERY different Medicines and the Moose in the journey wants to be seen for what he is…. I try to fix him in the journey, but Väinämöinen starts singing = the Kalevala itself talks about Elk and – so I can not fix that…. So on one side it is Chinese to me to hear strange sounds during journeying but on the other side I could be the translator… ifffffappropriate of course….. The Drum , the film reels and the Bear. So nowadays there is resentment against this and it comes up, when First Nations Elders hear none Natives play that rhythm on a drum. Some are quite vocal about it….. It happens often and on several occasions I had to defuse the situation with teachings for both sides and so bridge the gap…..
What many first Nations so far are not yet familiar with is, that other shamanic Ancestor ways – like in Europe and South America use this rhythm and it is part of their culture and not just miss appropriated or picked up from an old movie… We in Siberia for example use this drum rhythm as one of the East rhythms – to ward of unknown disease Spirits that usually – as seen by my people – approach from the unknown future = East. For us Bear guards against these. So here Bear is well aware and points out the problem by tossing the old Pow Wow drum into the fire and Lira adds snippets of moovie reels…. In this case it comes from Dalva’s Finnish tradition and that is wonderful and very spiritual. And yes, there are many drum circle songs with that rhythm and also some First Nations chants from the Southern tribes = rain songs for example…. Not that we need more rain in Ontario right now…. Here we are being made aware of cultural sensitivities – no rain songs when there are floods – or no John Wayne drumming …. And Yes, my Guides alert me to the problem and tell me to explain to Dalva, because it is her skirt that was burnt in the fire = “something” happened somewhere in the recent past and the smoke is still in the air but the fire is out. As Dalva said in her teaching: In Finland and in Siberia we journey for looooong times – and 1 hour just flew by. When a journey needs to be aborted – or I get “tossed out” by – the proverbial phone ringing, someone touching me, or whatever, I often start to shake quite badly and it takes a while until I am back in OC….. This time it felt like being stuck in heavy molasses that was dragging me back…. Later in the evening Dalva and me had a long wonderful talk and several other practitioners joined in. Nowadays one may think, that the petroglyphs and pictogram s strewn across the rocks in Finland and Karelia are the only remaining traces of shamanism that is left in this region. But that is far from it. Because there also is the Kalevala! Since ancient,pre-christian times the descendants of the mythical hero Kalevo have preserved and transmitted their cultural knowledge, their ways of being, of courtship, of hunting of waring, healing and shamanizing in the form of poems called Runes. These Runes were sung on all kinds of occasions and especially the ones containing spells were also used in ritual context. From 1832 on Elias Lönnrot, a Finnish physician and linguist carefully collected a vast number of these Runes and corresponding folk tales and then assembled them into the Kalevala, the Finnish national epic. He revised and expanded this monumental work in1849 to include more Runes from other Rune singers he had previously not visited. This, the revised Kalevala, an adventure tale about the ageless Elder shaman Väinämöinen, the blacksmith Ilmarinen, that forges magical treasures, the maiden Ainu that transform herself into a Pike, a Fish besaged with powers, the adventurous Lemminkäinen, son of a very powerful shamaness, that defies death itself and many others is a good source to uncover the old shamanic heritage of modern day Finland. As a shamanic practitioner interested in the old Finno-Ugric ways, one may very well criticize Elias Lönnrot for having created this epic according to his own notions, and in accordance with his Lutheran worldview as well as the times he lived in. 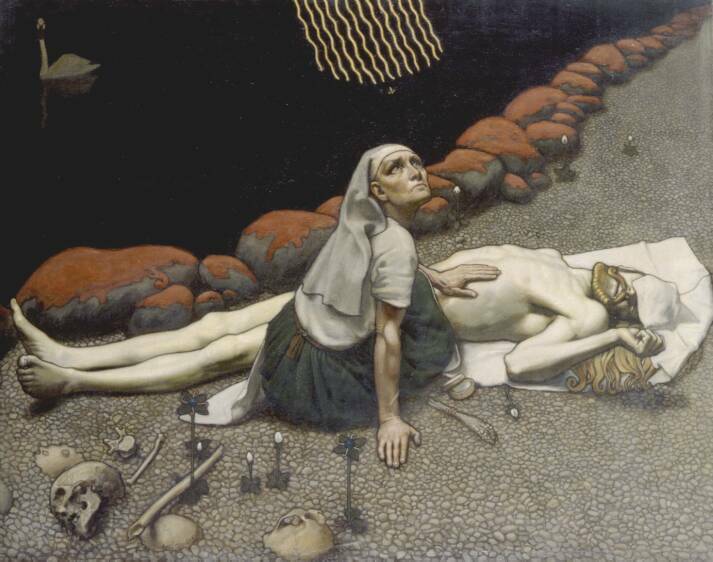 as you know, in the mid 19hundrets nationalism and finding pride in one’s own national identity as well as the romantic movement certainly influenced him deeply and steered him while assembling the Runes he saw relevant to create a Finnish epic, while letting others fall by the wayside. He however kept clear and concise notes of all his findings and all the Runes he collected. Today I consider this material a treasure trove of information. For the last couple of months I have – on and of – communicated with Dalva Lamminmäki, a shamanic practitioner from Finland, who is now coming to Canada to visit and teach for a month. 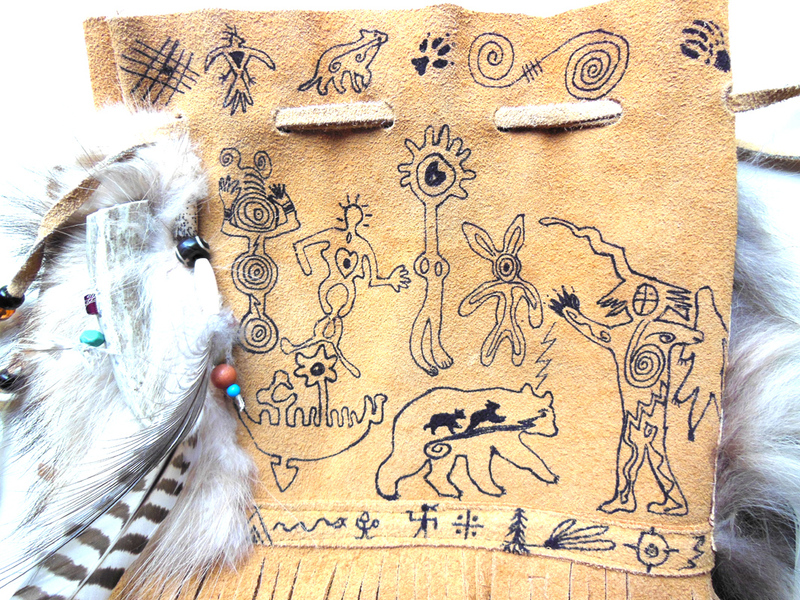 It also encouraged me to create a special shamanic piece to commemorate Dalva’s stay here, the similarities of the rupestrian art (petroglyphs and pictograms) in her home land, my ancestral homeland, Siberia, and our chosen homeland Canada. Not only do we share similar – if not identical rock art / Medicine drawings, we also share a vision – as shamans always have. Our stories and legends may be slightly different and now is the time to compare them and rejoice. Deer-leather: Shishkeshkeshi, the Deer stands for Morning, East, Future, Love-magic, sexual attraction, poise and non-violent means of defence. Deer is grace, swiftness and gentleness It lives in the dawn of morning. For the early hunter/ gatherers in Northern Europe and Siberia, the Wolf was the symbol of powerful Magic, strengths and the teacher of the hunt. From my Siberian indigenous Father’s side I am a member of the Wolf clan. In Siberia Kaltes is our Spring moon Goddess and awakens the frozen Earth to new life. She is always shown either as a Rabbit or with a Rabbit. Deer and also Rabbit is one of the main food sources for Wolves. Moose and boat – Lake Onega, Karelia, Russia – across the arbitrary border with Finland. 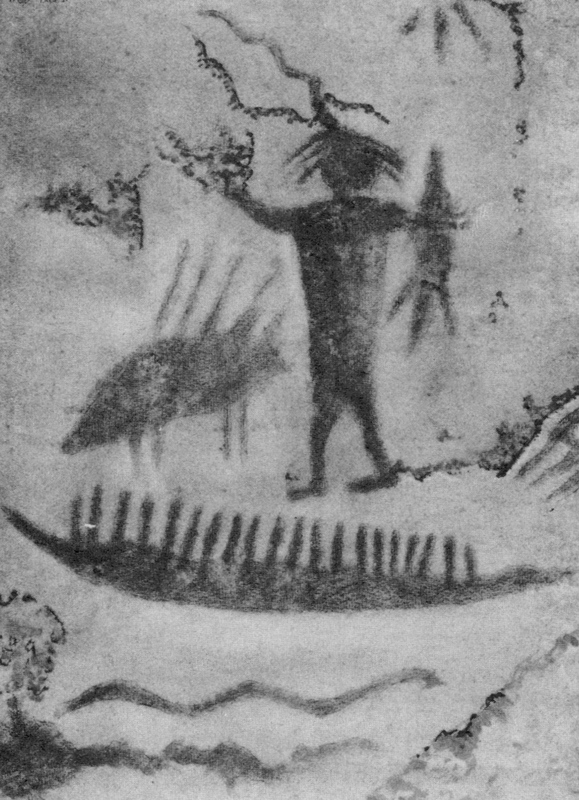 Prehistoric Fino-Ugric boat glyphs often clearly show a large antlered Moose or Deer steering the boat. 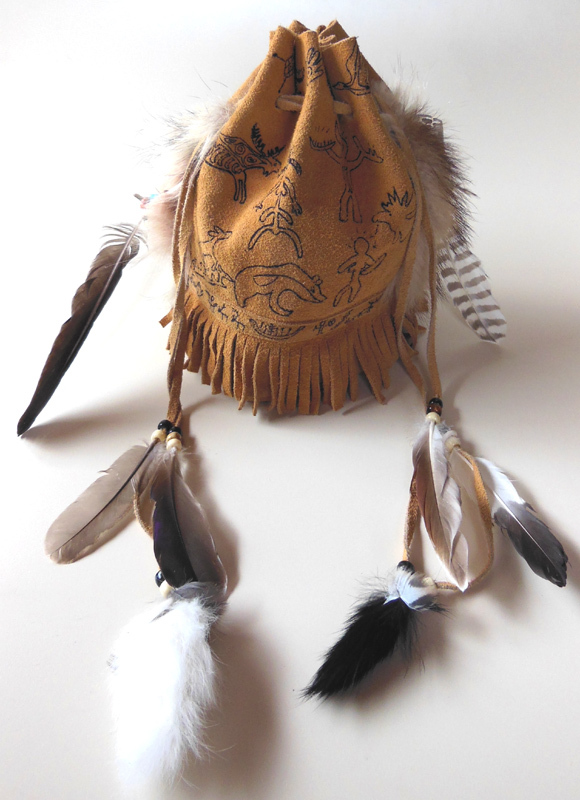 Shaman with Otter Medicine bag (first year Midewewin teachings) Bloodvein River, NW Ontario. Only when I sang them to a hereditary Chief of the Anishenabe from Curve Lake reserve, he told me, that this was Ojibwa, what it means and that it was a Sacred song, that was old and very special, had been lost for a long time and I was not to sing it in “ordinary context“, just to my students and when doing “Medicine Work” He then asked me, if I would allow him, to “bring this song home to his people. Sure I said and taught it to him. He then gave me a Tobacco Bundle with Eagle down in exchange.